Regardless of from which perspective an investor decides to look at things whether they are economic advisors for governments or strategic tacticians for corporations or treasuries, the current market conditions have lead to a situation where nobody seems to understanding anything, only because there is nothing to be understood. As the world keeps pondering on the fact that gold prices are dropping, nations that produce gold and their currencies have depreciated against the dollar say otherwise, because gold prices have risen for them and it looks like the way that the commodity markets are moving coupled with the current currency slides of major global trading companies particularly China, another major financial crisis is definitely knocking at our doors. Yet, gold prices are not moving forward as many would expect because each time it inches, the Feds come up with announcements of hiking rates which move markets back into line. This however, cannot go on for long as the market has grown tired and most investors are getting jittery over what they are going to do next. Many have resorted to buying undervalued small cap mining stocks based on the fact that many of these small caps are actually under streaming finance and are poised to spring into action as soon as gold prices hit 1,300 USD per ounce and above. The early sputter of the precious metal market early in the year has all but died out and currently markets are focused more on mining stocks than physical bullion itself. 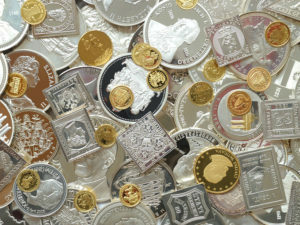 Silver seems to be labelled as a manipulated market when the fact is that silver dependent on gold mining and based on the fact that many companies have reduced or slowed production with the hopes of reviving gold prices, the silver supply is also being stumped creating a supply glut which is pressuring silver prices upwards. As the world braces itself for more currency devaluations and perhaps even hyperinflation, investors are actually expecting the precious metals market to keep them safe, however, unless you are holding on to mining stock or physical bullion, any other precious metal related asset may not be worth the paper the ownership is stated on as if at all the world is hit by another financial storm, most of the companies that issued these ‘papers’ would declare bankrupt and unless they are backed by the government, nothing can be gained from them. According to analysts a deflationary crash response would most probably see the purchasing power of precious metal increase by leaps and bounds, however the complication would far from be over as these responses will only be met with counter responses from a chaotic and volatile market condition that is locked in a vicious cycle that will not end soon enough. The only ones who would be smiling will be those holding on to small cap mining stocks and those who are in possession of physical silver and gold bullion as their liquidity would be extremely high and they would be on top of the investment chain.